I’ve moved on to a new project recently. It’s quite different from the previous one. Before I worked on a monolythic web application, now we’re using OSGi. As a result, our project consists of a lot of sub-projects (OSGi bundles) which makes it very inconvenient to use Ant. So we’ve switched to Gradle. Our company has also standardized on Perforce, where we used Subversion before. To summarize, a lot has changed and I’m not really up to speed yet. This is evidenced by the fact that I broke our build 4 times in 5 days. As an aspiring software craftsman, I feel really bad about that. So why did this happen so often? And can I do anything to prevent it from happening again? Enter Root Cause Analysis. problem will just reappear later in a different shape. 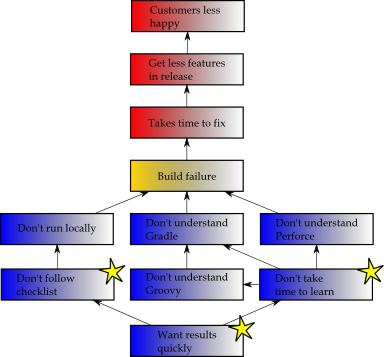 I started out with the problem: Build Failure, in the orange rectangle. I then repeatedly asked myself why this is a bad thing and added the effects in the red rectangles. Just repeat this until you find something that conflicts with your goal. Finally, I repeatedly added causes in blue rectangles. You can stop when you’ve found something you can fix, but in general it’s good to keep asking a bit deeper than feels comfortable. This is where the Five Whys technique comes in handy. As you can see, my main problem is impatience. For those who know me, that won’t come as a surprise 😉 However, in this case this personal flaw of mine gets in the way of my goal of making customers happy. The last one is the hard one, of course. Wish me luck! Update 2010-08-01: I have created a checklist with things to consider before submitting code to our Perforce repository and used this checklist all week. I broke the build twice this week, both times because of special circumstances that were not accounted for on the checklist. So I think I’m improving, but I’m not there yet.